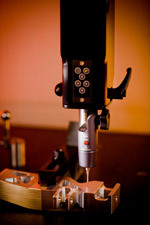 A full line of inspection equipment including a CMM assures part accuracy. All parts are subjected to not only in process, but final inspections and first article inspection reports are supplied upon request. DayCo Manufacturing is ISO 9001, AS-9100 Certified and is recognized by the International Aircraft Quality Association as an approved supplier for the aircraft industry. Copyright © 2019 DayCo Manufacturing Inc.